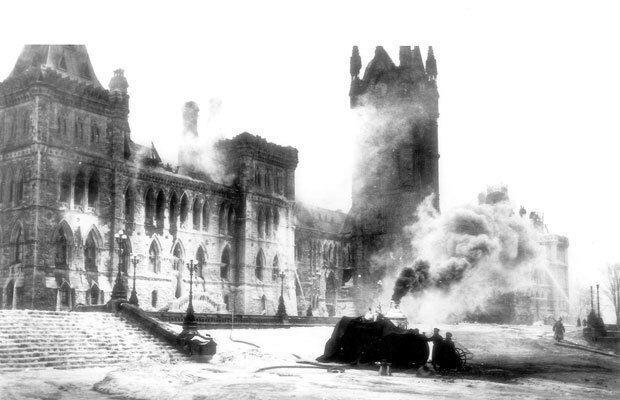 The Canadian Museum of Nature is hosting a talk to commemorate the centennial of the fire that destroyed Parliament Hill's Centre Block. The cause of the fire remains a mystery. On Feb. 3, 1916, Parliament went up in flames. A day later, the House of Commons was moved to the Victoria Memorial Museum, now the Museum of Nature, and remained there until 1920. Dr. David Tough of Trent University will speak about the political significance of the fire, which occurred during the First World War. Seats are quickly filling up at the museum for Dr. Tough's presentation as we approach 7 p.m.
Alisa Barry, Vice-President, Experience and Engagement at the Museum of Nature, is speaking now. "The fire was thought to have started in the Parliamentary meeting room and quickly spread to the entire building," says Barry. "Seven lives were lost," says Barry. Geoff Regan, Speaker of the House of Commons, talking now. Dr. Tough takes the podium. 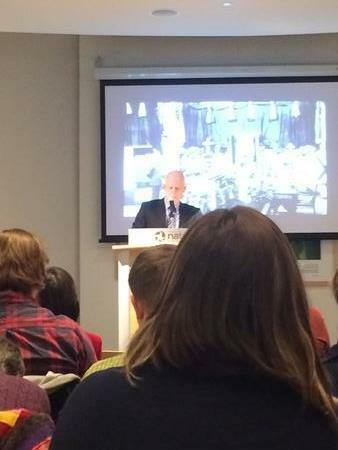 Dr. David Tough of Trent University speaks to a room of about 40 people at Ottawa's Museum of Nature. "Within a few hours it killed seven people," says Tough. Tough says Parliament was held in this very room where the audience is sitting. "I want to tell you why it is still important to tell this story," says Tough. Tough acknowledges the development of a woman's right to vote in Canada during the period that Parliament sat in the museum. Tough says there was a "reorientation of political struggle" during the time Parliament was in the museum. "Fire is an important theme in Canadian history," says Tough, explaining this was not the first time there was a fire on the hill. 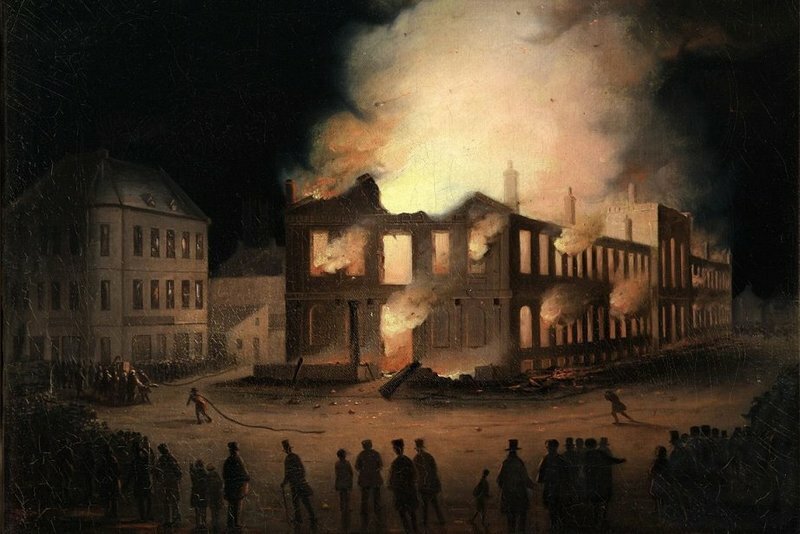 Here's what the 1849 fire looked like. And here's the 1916 fire. Tough says there was a massive decline in voter participation in the 1890s. "Politics was only about which party was in power then, not the people,' he adds. Farmers and workers did not see themselves represented in Parliament, Tough says. Tough compares WWI to 9/11. Says it brought people together in the beginning, but as time went on, negative feelings began to grow. Tough says the elite began to see the people as untrustworthy as people stopped signing up for war. 1916 and the time of the war was a turning point in politics, says Tough. Until then, people volunteered to go to war. 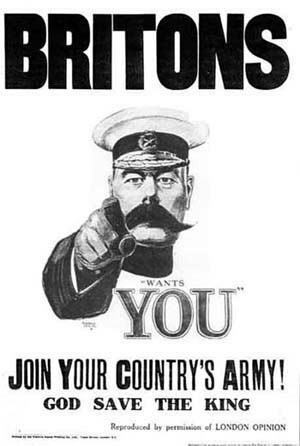 Conscription was introduced the following year. Conscription was introduced in Canada in 1917. This was the type of propaganda used to persuade people to join the ranks. Tough speaking now on the rise of women's suffrage after Parliament burned. He said it would have been a shock to see a woman in the House at the time. "I'm going to talk about income tax now and it's going to be really, really interesting," Tough jokes. Crowd chuckles. "The people wanted income taxation," says Tough. The atmosphere in the museum after the fire was charged, Tough says. People were talking in very open ended ways about taxation during the war. This wasn't the language common to Parliament before the war, says Tough. The government was uneasy with the idea of conscription of wealth, says Tough. There was a threat of a strike from munitions workers in 1916 if the government didn't introduce an income tax. "There was a loss of charisma in Parliament. It was becoming an echo chamber for ideas that were generated elsewhere," says Tough. Moving on to how the physical space of the museum as opposed to the House of Commons affected Parliament. Parliament declined in physical terms after Centre Block burned. They had nowhere to go. Loss of prestige in Parliament due to the loss of Centre Block and the move to the museum, says Tough. "The sudden shift to a new space was difficult, and it brought out the worst in Parliamentarians"
Announcement comes over the speaker to tell people the museum is closing. Audience is startled, then laughs. Speaking now about discrimination against women in politics at the time. Tough says the issue of women in Parliament was heavily discussed. "Before the fire Parliament was a sanctuary." "Parliament's loss of prestige was a net benefit to the country as a whole." Tough says people now vote in an intelligent, thoughtful way... Most of the time. Says the fire was good for Parliament because it forced people to think about how they wanted to run the country. "This shift, this history happened in this room. Women earned the right to vote in this room." Tough says the fire also burned down an old Parliament and created the modern politics of today. "We should remember the Parliamentary fire." Tough wraps up. Time for audience questions. Audience member asks about press access in the museum. Tough says he does not know. Audience member asks about enemy attacks and suspicion of arson behind the fire. "People had trouble believing it was an accident," says Tough. Tough says it was hard to accept the fire just happened. There were lots of rumours and it was easy to believe them because it made a better story, he says. "Some believed they were the target of a terrorist attack." A woman asks about violence in suffragette tactics in Britain at the time and if Canadian women used the same strategies. Tough says his colleague says there were no suffragettes in Canada in the sense of a radical movement. The word "suffragette" has a negative connotation.The movement was much more tied to churches here, but in Britain it was quite radical. Tough says the violent tactics of suffragettes in Britain were unsuccessful for the most part. Tough thanks the audience and leaves the podium.